this modern day, existed. 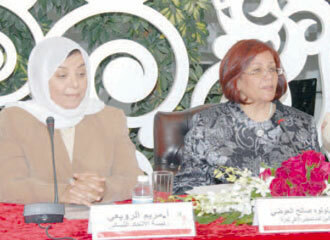 She also added that the ‘State cannot impose a certain law on a whole sect in society’.The President of Bahrain Women’s Union, Mariam Al-Ruay commented on this subject by saying that ‘passing a law with one section only enhances the fragmentation of society, divides its people further and prolongs the suffering of a large section of women’. In the same line, Ms. Fawzeya Al-Saleh, member of the Shura Council, drew attention to the fact that the Family Law includes two sections - political and religious (the latter relates to Islamic jurisprudence). She stated that the State should agree with the opposition in order to resolve the political section of the law. As for the religious section which has not been agreed upon, this should remain under discussion. Among the controversial articles included in the Family Law, is the right of women to annul marriage and ask for divorce. In the case of divorce, the woman must remain in her house until the ex-husband provides her with another form of residence. In addition to this, the man has no right to force his ex-wife to relinquish the custody of the children. The law also allows the testimony of women as proof of marriage or divorce.